Pat Robertson Prays That God "Throws Confusion" Into The Minds Of Brett Kavanaugh's Accusers [VIDEO] - Joe.My.God. 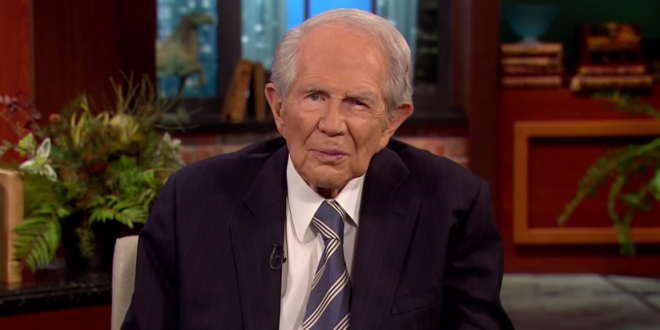 Scamvangelist Pat Robertson opened today’s show by asking viewers to pray with him that God strikes “confusion” into the minds of Brett Kavanaugh’s accusers. Throw confusion into those who are bringing false accusations against a future Supreme Court judge. Father, even as David said, ‘Throw confusion into the counsel of Ahitophel,’ we pray that, somehow, the Holy Spirit of God will throw confusion into the counsel of these myriad accusers who are coming forth against a good man who can serve honorably for decades to come in the Supreme Court. Lord, do it. We pray in the name of Jesus, throw confusion into their counsel. Thank you, Lord. Amen. Watch in particular the beginning of the clip below as Robertson says that anybody who would believe the accusers would also buy into “the myth of the Great Pumpkin.” Ahem.